Imagine the daily difficulty for the many in our society who do not have basic skills to navigate the world. Literacy, of course, is vital, and we need to remain committed to flipping the script on this ongoing crisis. “An alarming number of children—about 67 percent ­nationwide and more than 80 percent of those from low-income families—are not proficient readers by the end of third grade,” according to the Campaign for Grade-Level Reading. After that, as Heather Booth notes in “Unlimited Engagement,” it’s difficult to to catch up, and the lifelong impact is a tragedy. The costs of such failures of the system are high for all of us, but especially for the people left behind. Librarians and educators are well aware of this challenge, but can likely use one tool at their disposal more effectively: collaboration. The challenge and our challenged resources call for a renewed focus on partnership across institutions. There are amazing examples to learn from and emulate. 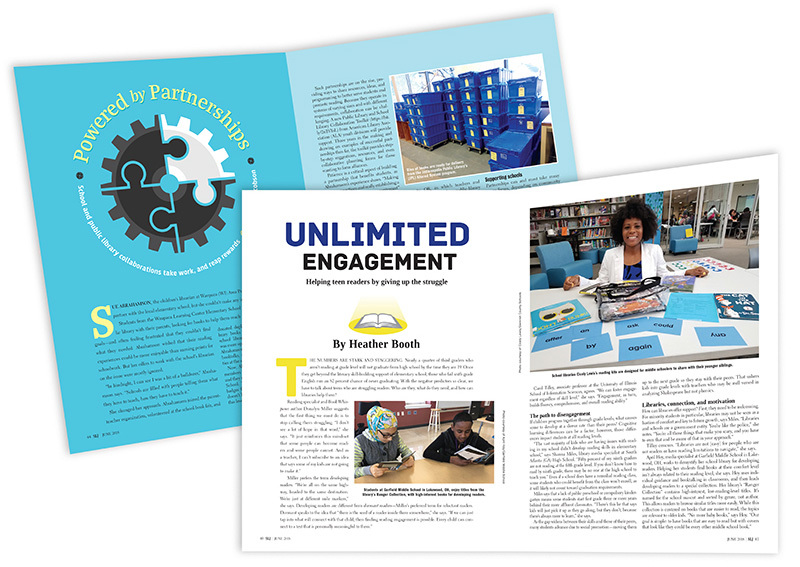 Booth’s article focuses on working with teens who are “­developing readers”—an optimistic framing that counters the negative term “struggling.” On the other end of the collaboration continuum are those that enable the sharing of materials between public libraries and schools at scale. Linda Jacobson’s “Powered by Partnerships” taps into several, including the robust ­Indianapolis’s Shared System. Indianapolis is among the cities that are innovating on access to materials represented at our recent “Stronger Together” event held in May in Omaha. That deep dive explored how collaborations like this actually work. Over three days, via a program developed by SLJ and sister publication Library Journal in partnership with Omaha Public Schools (OPS) and Omaha Public Library (OPL), we dug into the intricacies involved in advancing ­collaboration. Speaking of which, I want to give a shout out to the smart and passionate Omaha team, our collaborators on the project. Thanks to OPS’s Stacy ­Lickteig, project coordinator, library services; Courtney ­Pentland, lead teacher/research librarian; and Laura ­Pietsch, supervisor of ­library services; and OPL’s Julie ­Humphrey, youth and family services manager; and Jody ­duRand, partnership/community engagement manager. Together, they and others on the ground helped us envision and shape an important national conversation about the ins and outs of these partnerships. Their collaborative style echoes the collegial problem-solving exhibited by the teams from the representative cities. If you are already maximizing the potential of partnerships, kudos. Nonetheless, it might just be worth a second look. SLJ’s 2017 spending survey found that only 18 percent of responding librarians placed their level of partnership in the 7–9 range on a continuum of 0–10 from no partnership to full integration. There may just be room for more robust engagement. That outcome, of course, is what matters most. Across institution type, we want to facilitate greater ­access to materials, excite readers with choice, and help build literacy skills along the way. Let’s keep deepening this work together.